URACA KD Series Plunger Pumps The URACA KD series plunger pumps are used for handling thin liquids to pasty substances with aggressive, neutral, abrasive, hot or toxic properties. The power ends are of standard design, whereas the liquid ends are custom built. The materials of the wetted part are selected according to the liquid, e.g. carbon steels, chromium steels, chrome nickel steels, duplex stainless steels, aluminum bronze, or if necessary Hastelloy, tantalum, titanium or inconel alloys. The main features of the KD series pumps are forced power end lubrication and the exact alignment of the stuffing boxes within the power end, allowing for easy maintenance. Low specific loads on all moving parts prolong service life. Click here for KD 800 Series Plunger Pump specifications. 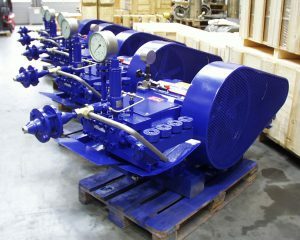 Contact us for info and specifications on other KD-Series pumps.